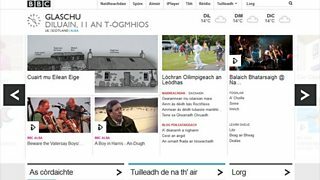 Back in November when the new BBC Homepage launched, my technical counterpart James Thornett and his boss Phil Fearnley described how the team intended to evolve the product over time and improve the homepage for all users. As homepage editorial lead, I'm happy to announce a significant new development as the BBC nations' homepages become an integral part of the main homepage product. From today, if you change your location to a place in Wales, Scotland or Northern Ireland, you will see navigation and content from the country you've selected, alongside other content of interest UK wide. This change enables us to more fully and appropriately respond to cultural, political and topical interests across the UK. Local TV and radio listings, weather and, at a later date, news, travel information and sports news. Today's launch marks an important step in the journey towards offering users the opportunity to personalise their homepage. And in uniting our homepages within a single set of technologies, we have eliminated the need to build, service and maintain separate sites. This saves money, and means that nations and indigenous language homepages will develop iteratively alongside the UK-wide editions. The site continues to develop so your comments and feedback are very welcome.